Experience a relaxing stay in our 70 acres of lush green meadows and woodlands, as well as the historic setting for the birth of our nation in Williamsburg, Yorktown and Jamestown. It looked like an Airstream club was meeting the weekend my family stayed here and as such a great number of the sites were occupied. Even with the volume of sites taken, the camp ground never felt crowded. The sites are easy to get in and out of. The bath house was very clean. The proximity to Busch Gardens is great! We look forward to returning soon! Great location for exploring Jamestown, Williamsburg and other historical places. 8 minute drive to Water Country USA water park (worth it!) and 30 minute drive to Newport News. We felt it was a bit pricey, but realize we were paying for the location. The inflatable waterslide cost extra to use ($12.00 for 3-4 hours per ticket). The dog run is located way away from the campers, across some sort of grassy parking area -was not a fan. The game room is a bit small and our 8 and 11 year olds were not impressed. Staff were friendly and facilities were well maintained. If we are in the area again, we would consider staying here again. This is an older park and some of the facilities are showing their age. The site was very level and did accommodate both our 40 ft MH and our tow vehicle. Concrete patio has a large by very dilapidated wooden picnic table. Grass area around site is pretty sparse. Streets are narrow, so if you have a bigger rig, make sure you turn wide when turning into your row. Park was quiet except for trains at night. Some sites face an accumulation of construction equipment, so would ask about that when booking. In my opinion this park should not be rated as highly as it is by Good Sams. The first thing I want to say about this park relates to its location. It is off exit 231 on Interstate 64 and it is well off the beaten path. You can translate for me when you go into the campground be careful because the big sign you will miss as I found out the hard way and the little sign is a little tough to read. Do not listen to the GPS it will guide you wrong. 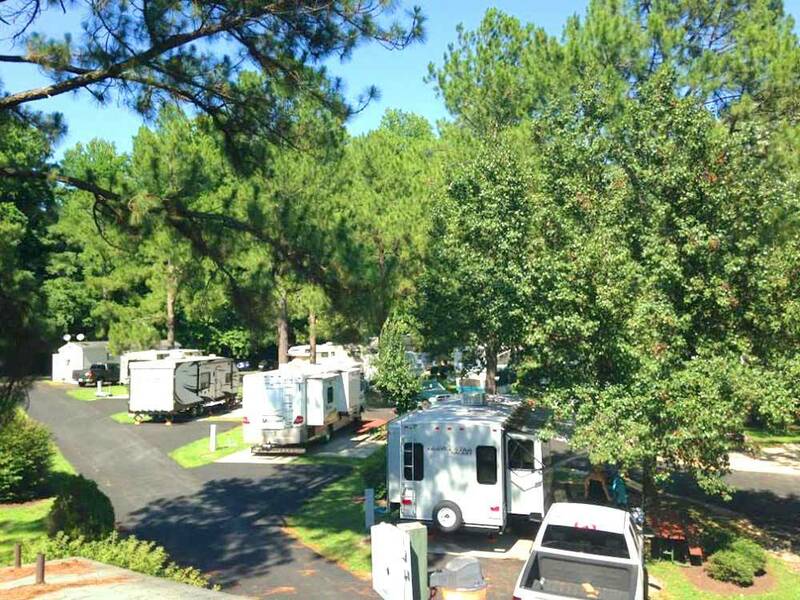 The campground has most amenities you could ever need while camping. If you're looking for a five star hotel experience this is not the place that's what they have hotels for. Most of the sites that I saw were level period I did not see any weird contractions to level the coaches or the trailers here period I have not looked at the bath houses because we have facilities in our coach however they appear to be very clean and well placed throughout the Park. If I could change anything it would be the size of the sign when you come in because it's a little bit off the road and the fire pits are barrels that are portable which can kind of sort of be a hazard if you have to move the wood in them. They work fine but I would like to see permanent fire pits on the sites. Side Note: I've heard some people complain about the train but if you are in Williamsburg trains go through and there is absolutely nothing you can do about it no matter where you are. Sites are mostly in shade. Sites are small and not easy to get in with a 37ft trailer with slides towed with a crew cab. Sewer hookup is located at the end of the lot making it hard to reach if your outlet is located in the center of your unit. Pads are short and narrow. Picnic tables need refurbished. Very nice campground. Close to everything, but hidden enough to feel secluded. We will be back next year. I stayed at this park as it was the least expensive one in Williamsburg. With that being said, it was also the most expensive park I've stayed at. Facilities were limited to a pool, a "hippo slide" and small playground for children, and a laundry room with only half of the washers and dryers working. We had asked for a site near the bath house as my wife is handicapped, but we were put in a space in the new section down the hill with no shade. It is conveniently close to attractions and shopping. Highway and train noise is noticeable, but not excessive. If you can reserve a site from 1 to about 90, you can be much more comfortable with some shade and proximity to the bath house. The staff was mostly friendly and helpful. We stayed at the camp ground for 1 week. It was nice that we received the last day free. We found the camp ground itself to be pleasant. The camp site itself ( lot 41) was a little tight when having to park our 5th wheel (43 feet) and our truck also on it. We had a premium site because it had a brick patio with retaining wall, table with umbrella, chairs and a grill, and found it very accomadating. However, what we did not like about this lot is that it was located next to the bath house. In addition, there were high voltage wires that passed above our site and therefor the roof of our rv. The wire connected at the roof of the bath house and over the site to what looked like a large transformer on a post on the opposite side of the site. A large pine tree also hung over the site and the branches were on the wires. This was rather frightening considering that we had a couple of severe thunderstorms go thru the area, and this left me concerned about our safety. We are fairly new to rving so we considered asking to move, but ultimately we did not as we knew it would be a hassle, we were already settled in, and there was not another site available of that type for the weekend. So, although I would recommend the campground ,I would not recommend booking this site (#41) and I do think people should be advised of the electric/ utility lines when they book it. Also for this reason I do not think it should be a premium site. Excellent campground. Bathrooms were top notch. WIFI had no restrictions. We could even stream Netflix!!!! Super close to historic areas. Would definitely stay here again! Have stayed several trips to Williamsburg, friendly staff and sites are level, and most older site have good shading. Very centrally located to all historical and fun locations, Appreciate the open spaces and walking trails at this campground, perfect for younger family members and our animal family.Expansion in number of sites has been on-going, would prefer to see more trees/shade with these additions. Our go-to campground for this area. Excellent campground! The only reason for the facility and restroom ratings are lack of handicap accessibility. The office / store is not accessible at all for those in wheelchairs or scooters. The restrooms have very tight turns trying to get in and out. 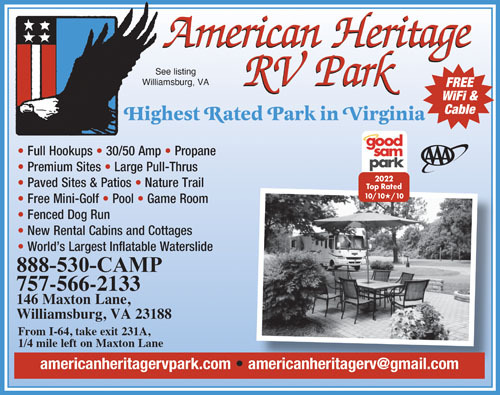 This is our preferred campground whenever we visit the Williamsburg, Va. area. It is quiet, even with children running around, convenient to Colonial Williamsburg, 8 miles west, convenient to get to from the interstate, but far enough away so the traffic noise is very low to non existent. Friendly campground personal, paved roads and concrete pads in the finished area. New area is being worked on and does have dirt roads at present. Parking pads are almost level side to side, so very little blocking under wheels is needed. Overall, just a niece place to unhitch your camper and enjoy your stay.